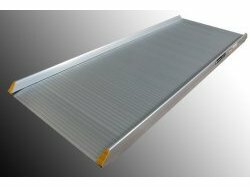 Lightweight aluminium loading ramp for use with our panel vans. Ideal for loading items with our sack truck or rock n roller multi cart. These are great for when you need to load on your own. Dimensions: Length 2440mm, Width:700mm, Weight capacity 250kg.